QMS Advisors’ approach is to construct robust, time-tested yet innovative solutions designed to meet the needs of investors by taking a global, total portfolio approach to investment challenges while drawing on our advanced proprietary models. Our solutions are designed so as to maximize the risk-adjusted total return of our client’s strategic portfolio, while respecting our client’s guidelines in terms of tracking error risk at the asset class level and risk budget at overall portfolio level. The first step of this process requires a careful analysis of the client's cash flow projections, risk aversions, rate of return requirements, and any unique policy or regulatory considerations. The basis of QMS Advisors process is to jointly develop an Investment Policy Statement (IPS) with the client, which meets both his objectives and constraints. QMS Advisors develops comprehensive investment policies that integrate the client’s objectives and constraints as well as each investment manager’s goals. QMS Advisors has further developed adaptive portfolio rebalancing and dynamic risk assessment frameworks that provide the client with realistic backtests of the recommended Investment Policy Statement. Our client’s goals and objectives. The investment manager's goals and objectives. Appropriate benchmarks for ongoing performance monitoring. 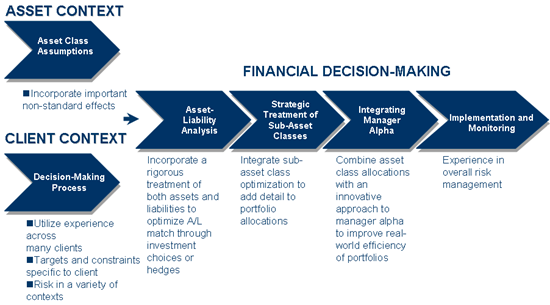 Adequate asset classes, target asset mixes and optimal asset allocations. The impact of rebalancing methodologies.